I just got my november ipsy and I realized that I haven't done a review about it in a while. Because this month what I liked the most was the little makeup bag, I decided to do something different inspired in its design and colors: A makeup tutorial using this month's products and some of the ones I received before. This is the first time I do something like this, I hope you like it! First I applied the Jessie's Girl eye shadow primer and to seal it I use it the color naked from my UD naked palette on top. You can use any brush you have but I used the puffy side of my double ended crown brush. With the same brush but with the thin side, I applied the darkest shade in my Pixi by petra mesmerizing mineral duo (from march ipsy) on the above crease as a transition color . I used the pink Luxie tapered blending brush (may ipsy) to blend it all over. 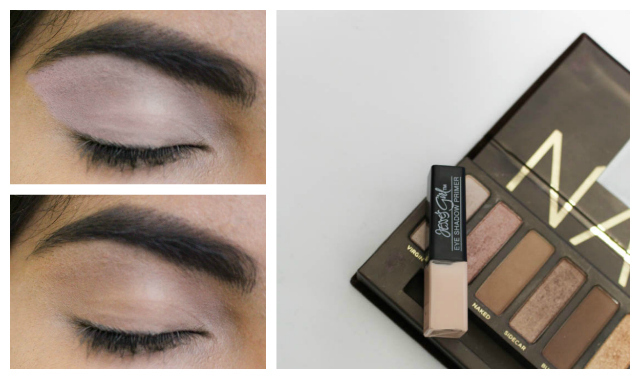 Primero aplique la base de sombras Jesse's Girl y despues para sellarla utilice el color Naked de mi Naked palette utilizando el lado grueso de mi Brocha doble que por cierto me llego en la ipsy de marzo. Como Color de transición use la sombra mas obscura de mi Pixi by petra Mesmerizing Mineral Duo (de la ipsy de marzo también), la aplique con el lado delgadito de la brocha doble que use antes, pero lo difumine con la brocha rosada ( ipsy de mayo). 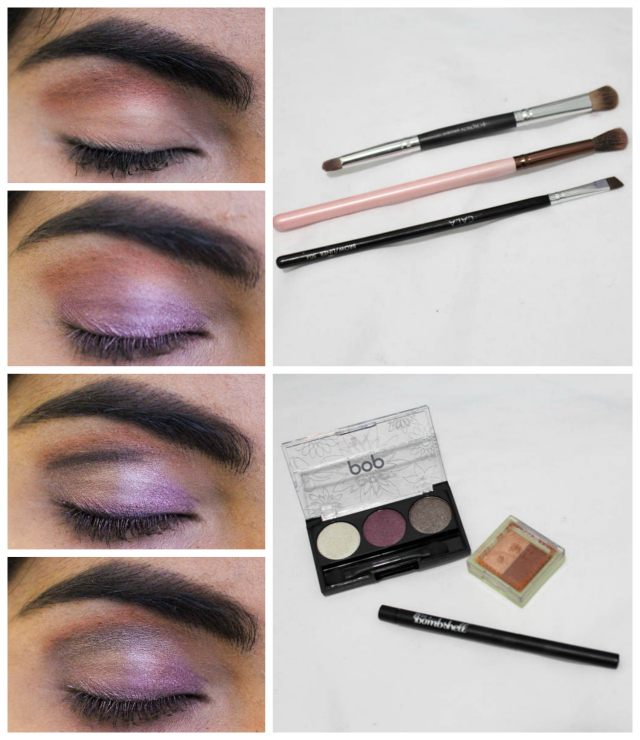 Then,using a thin angled brush I applied the purple eye shadow in the Color Pop "sugar plump" mini eye shadow trio on the eyelid and in the outer lower lash line. With my be a bombshell mechanical eyeliner I draw a messy line over the crease and I blended it out using the tapered brush with a little bit of the darkest (brown?) color in the color pop eye shadow trio. To add more light to the look, I applied a little bit of white in the center of the eyelid and I kind of blend it over the purple. I also applied the lightest shade in the mesmerizing mineral duo to the inner corner of the eye and over the inner lower lash line. Despues utilice el color morado de mi mini paleta de sombras "sugar plump" de Color Pop en todo el parpado móvil y utilizando un pincel delgadito también lo aplique bajo las pestañas inferiores . Utilizando el delineador "be a bombshell" que me llego este mes trace una linea en la cuenca del ojo y la difumine usando mi brocha rosa con un poco del color mas oscuro del trió de sombras "sugar plump" de color pop. Para darle mas luz a la mirada, aplique el color blanco/plateado del trió de sombras en el centro del ojo, y en el lagrimal aplique el color mas claro del Mesmerizing Mineral Duo. The last step is to apply some eye liner and mascara. I used this Kat Von D eyeliner (that I forgot to add in the picture) and the smashbox full exposure mascara. Para finalizar el look, el delineador no te puede faltar! Yo utilice mi favorito:el liquid liner de Kat Von D (que olvide ponerlo en foto). Y por ultimo, en las pestañas use la mascara smashbox full exposure. ps. Si te gusto el look no olvides compartir la imagen aqui abajo en pinterest! 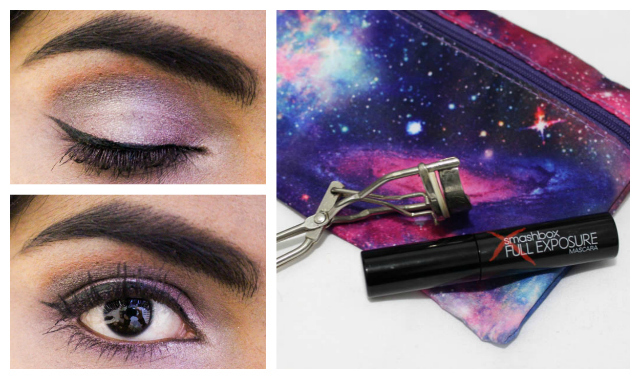 I really wanted to show you how you can create a cool look without having a big makeup haul. 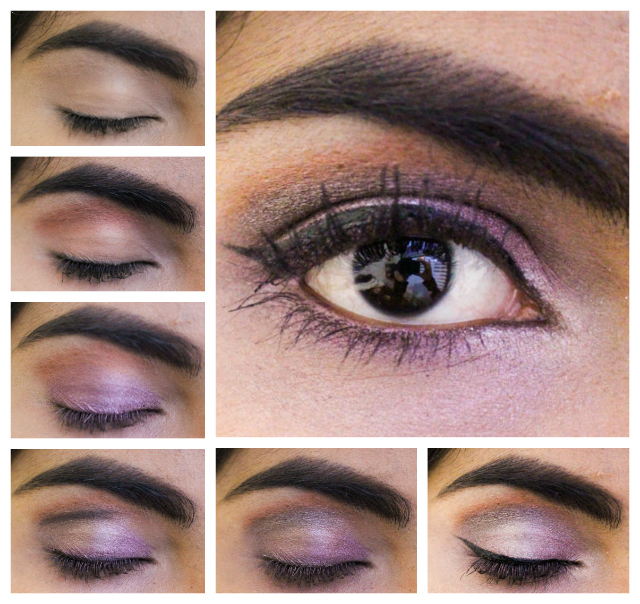 I love how this eye makeup turned up, this is perfect for a night out or when you are in the mood for a dramatic look. Trust me this colors are really intense and dark ,the lighting in this pictures made them look lighter than they actually are. What do you think about this tutorial? Would you like to see more post like this? 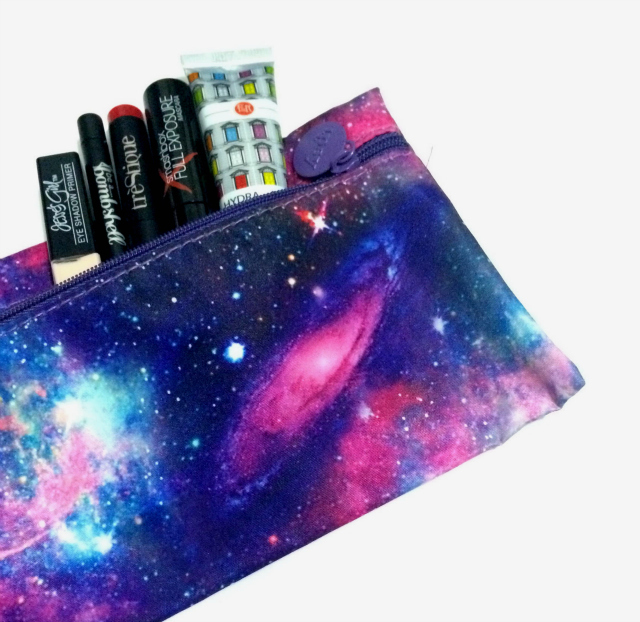 Como vieron no necesitan un kit inmenso de cosmeticos para hacer un maquillaje de ojos, con unas cuantas cositas básicas pueden hacer muchos looks diferentes! Este maquillaje yo se los recomiendo mas para la noche o alguna ocasión que requiera un maquillaje dramático. No se porque aqui no se nota tanto en las fotos, pero en persona estos colores son super intensos. Que les parecio este tutorial? Les gustaria ver otros post como este?